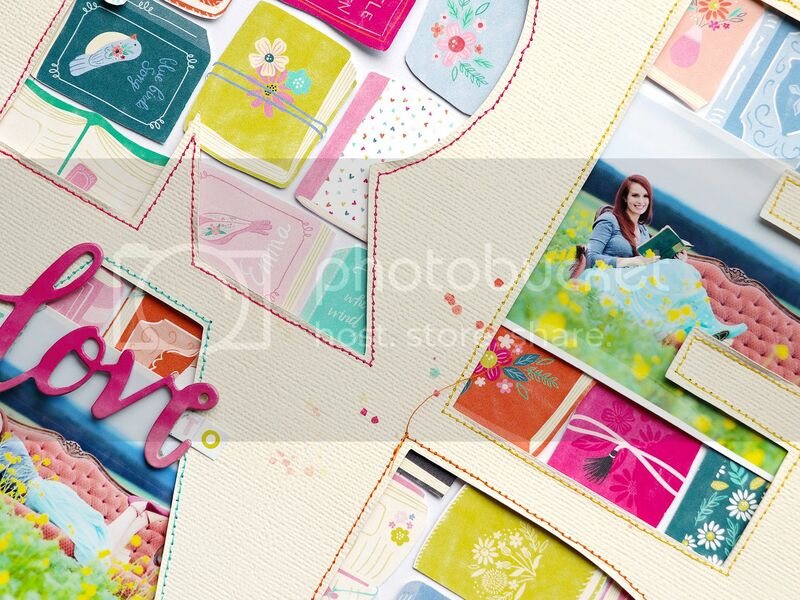 Starting off the new year revealing my new scrapbooking collection with Pink Paislee called Oh My Heart! 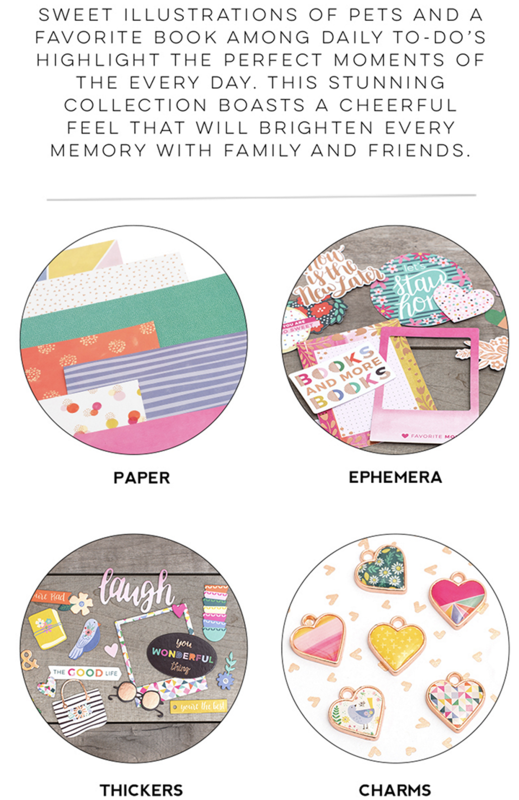 I've been having a total blast making layouts, mini albums, coptic books, and more with Oh My Heart! The burst of inspiration and ideas that comes when a box of my goodies arrives makes me wish there were 100 hours in each day so I could scrap scrap and scrap (cooking? what's that?!)!! DESCRIPTION: One of my very favorite papers in this collection is full of BOOKS! I couldn't wait to fussy cut them all out and use them on a page about how much I love to read. HOW TO: Fussy cut the books from Paper 15. 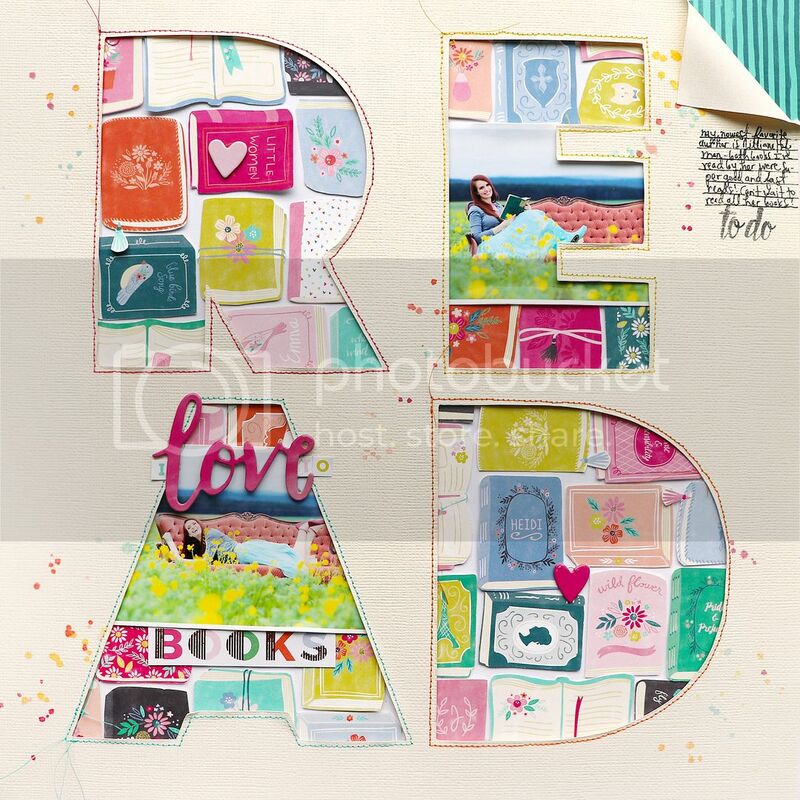 Die cut a large "READ" title from cream cardstock then sew around each letter using a different color of thread. Use the die cut page as a template to trace the letters onto white cardstock then fill in the drawn letters with the books. 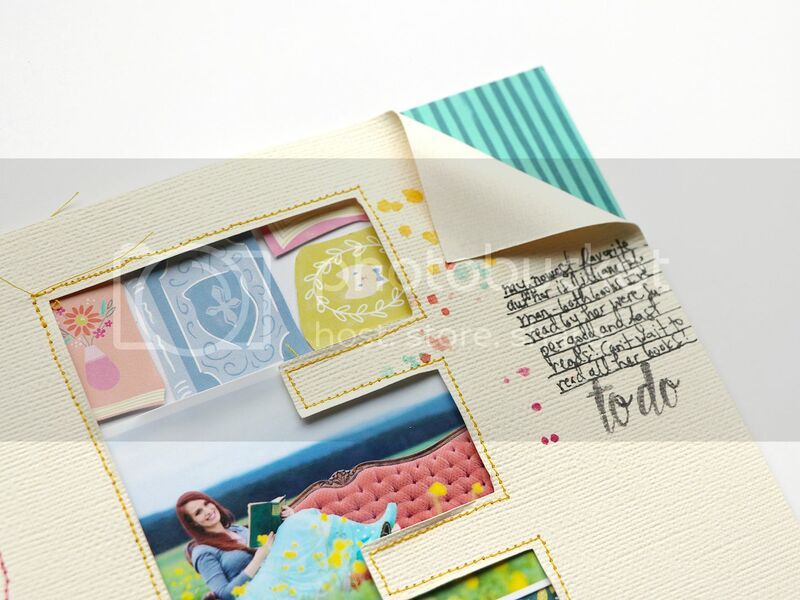 Adhere the die cut page on top using dimensional adhesive. Add a pair of photos and a title. Fold over the top right corner (like a doggie eared book page! ), replace the folded corner with a piece of patterned paper, then journal below. Drop watercolors around the page and stamp "to do" under the journaling to finish. Want to win an OH MY HEART goodie box?! Leave a comment on this post and tell me what product you're most excited about from this collection! I will randomly select a winner and update this post with the winner in one week (Thursday January 12th 2017). Open worldwide, please only one comment per person. OH MY HEART will be available in stores any day now and I am so excited to see what you make with it! UPDATED WITH THE WINNER, congratulations Amanda! Please email me with your address and your goodies will go out soon! Thank you so much to everyone who entered - I wish I could mail something out to each and every one of you. I hope you can get your hands on Oh My Heart one way or another! Until next time, happy scrapping! Oohhhh, I love your new collection just I loved the previous two! You are such an amazing designer!! And the Layout is just awesome. I love read books too and I am in love of this paper, so I have to say that my favorite are the decorated papers but I love everything! Wowzers what a beautiful collection - I love the colours. I am hoping to read more this year so these papers will be perfect to document the books read. My fave must be the puffy stickers - you can't have enough puffy stickers, right? Gorgeous collection - can't wait to see it in real life! I think this collection is made for just for me! :) I'm always a HUGE fun of floral patterns and these are no exception! SUPER LOVE everything about your new collection Paige!!! In general, the book-themed things are what I'm most excited about! But specifically, I can't wait to get my hands on the sticker book!! Such a beautiful collection Paige! As usual, the colors are so vibrant and gorgeous! I love the charms and the patterned papers! These colors are just calling my name. I love those charms they look just gorgeous Paige! And OMG this page is amazing!!! Hi Paige, I love the Ephemera pack. I can't get enough of all those cute pieces. Books and More Books! Love it. The charms are pretty darn sweet as well! The little charms are ADORABLE! I love the fun bright colors and patterns in the papers!! Everything is gorgeous! I love the book paper that you featured in your page. 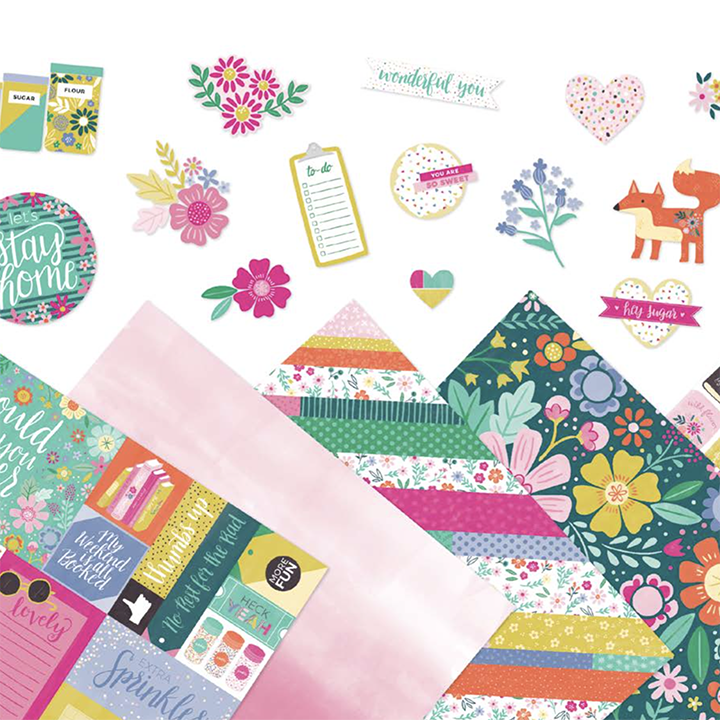 Cute puffy stickers and Thickers, great colors - awesome collection! Oh my goodness the cat on the gold paper! Looks Amazing! I love the books. 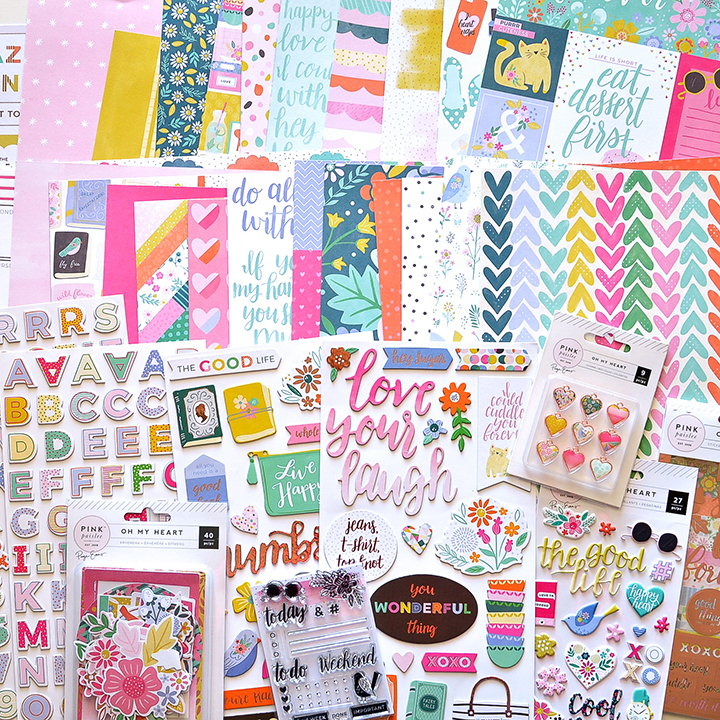 Love your newest collection & I can't wait to get my hands on the book patterned paper & stickers. My teen daughter & I are proud bookworms & now we can document our many reading adventures. Also, love the new website! Love this! It's alwayS about the papers for me! Oh my how do you choose just 1 favorite?! I have a thicker and puffy sticker obsession, so I would have to say the thickers!!!!! Thickers and the puffy stickers!!! Love! What a gorgeous collection!! 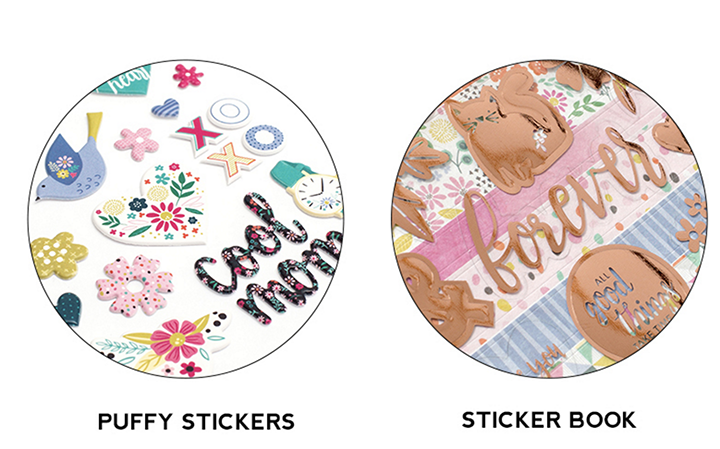 The "Cool Mom" puffy sticker got my eye immediately. I know I would love to create a layout with that sticker at the forefront celebrating me. I think I'm a pretty funky mom. Beautiful collection Paige! Thanks for the chance to win! Love your collections; my favorite thing about them are the color combinations. Love the patterned paper in this collection and have a soft spot for book paper. I used to read books under the covers as a kid after "lights out"....still love to read a good book into the wee hours. All I can say is wow! Thank you for including books! Any part of this collection that has books will be my favorite! Paige, the collection is just amazing .. again! LOVE IT! The best are definitely the charms i have never seen anything so sweet and cute! I would have said the heart charms until I saw the book paper. It's gorgeous!!!! This is a great new collection -difficult to choose just one favourite but the charms are gorgeous! Can't wait to play with this collection myself when it becomes available! I love the thickers! Thanks for the chance! Making me chose one bit is hard and so not right! Because I seriously am loving everything! As I love all the embellishments I think I am most looking forward to the papers -they can double as embellishments ;) Always love your bright papers and all the colors! Your rocked this collection! This collection is so beautiful. It comes along with all the things I love. If I had to decide, I would choose the puffy stickers. I can't wait to use them on my projects. I´m a mum und I love (cooking)books and I love the colours of the paper. I like the sticker book! Oh my... i love this gorgeous kit and your layout! I love the patterned papers, stickers and embellishements from this kit. Are those book stickers on the page?! So cool! I don't think I've ever seen them before and I am such a bookworm, can't wait to use them. Plus I love the floral letters in navy. Awesome job!! I love the ephemera! Great layout! beautiful collection, as always! i'm excited for the patterned paper with the books and the sticker book! So adorable, Paige! Love the colors of the collection - my favorite things are the charms! Lovely layout! Everything is absolutely amazing! I love sticker book! Congrats on the new line! I will always and forever be a patterned paper girl! It's difficult to chosse just one, all are lovely !!! But the puffy stickers have something special. Congratulations for your work !! Gorgeous collection and layout! I love the bright colors. The puffy stickers and Thickers are my favorite - lots of cool icons!! Ahhhh! I love books too! Such fun bright colors and I'm totally crushing on the puffy stickers! Such a beautiful collection! 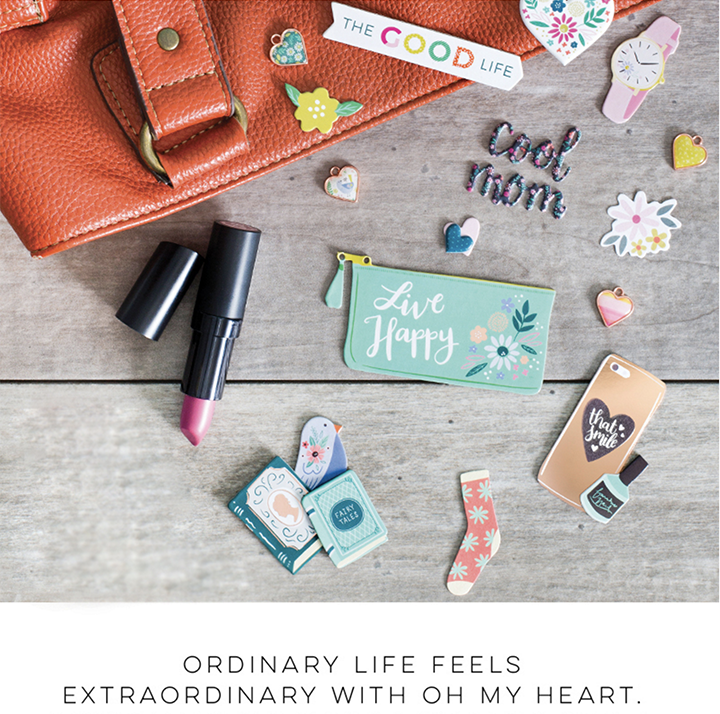 Loving the sweet beautiful line and crushing on the charms! I can see myself using it for many different things. Hi Paige, the collection is soooo beautiful! Love the Puffy Stickers, the little bird is my favorite! Puffy stickers! Cool mom, yes!! Very beautiful, most of all I like the ephemera. This is one of the most beautiful collections i have seen!! I can't choose. I'm excited about everything. That book paper! <3 I work in a library and it would be perfect for so many things. The colours are amazing in this collection!! Love the colours you have used. The charms and sticker book are particularly appealing. The blue bird puffy sticker - can't wait for it to fly into my hands! I love the colors, the stickers and everything!